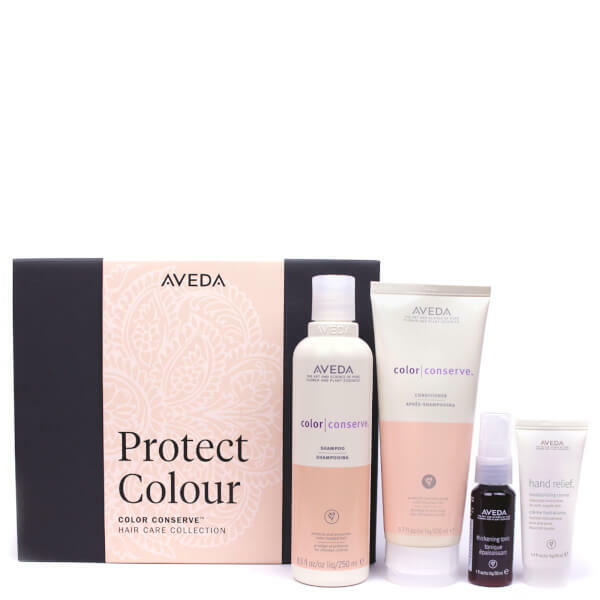 Bestow hair and skin to the nourishing benefits of plant-derived ingredients with the Aveda Color Conserve Full Size Set; a four-piece set that combines a colour-preserving shampoo and conditioner duo with a volume-boosting treatment and rich hand moisturiser. Presented in a sleek gift box, the Color Conserve Set will leave your locks vibrant with colour and body, and your mitts silky-smooth to the touch. Extend the vibrancy of your colour treated hair as only nature can. Aveda Colour Conserve Shampoo is a gentle plant infused shampoo, with 100% organic aroma, designed to resist fading. Aveda Colour Conserve Conditioner seals your hair cuticles to lock in colour and shine, while its 100% organic aroma brings nature closer. It detangles your hair while adding brilliant shine for healthy locks that boast incredible gloss. 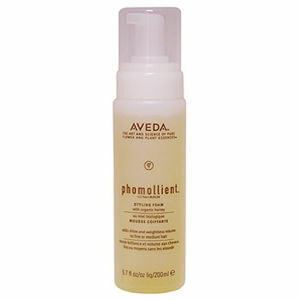 A powerful treatment that works to boost volume from root to tip. Packed with botanical ingredients, including certified organic Amla Fruit, its 97% naturally derived formula is ideal for thinning hair, allowing you to achieve a fuller, denser appearance after just one use. A deliciously rich hand cream packed with Vitamins A and E, exfoliating fruit acids, hydrating plant emollients and humectants, antioxidants that help diminish signs of aging and other plant-based ingredients for optimal relief. Scientifically formulated to provide extreme moisture therapy to your hands, it will soothe dry, chapped hands, leaving them noticeably softer and smoother. Thickening Tonic: Spray on thickening tonic thoroughly from roots to ends, in sections. Comb through to distribute evenly. Blow-dry your hair with a round brush, using a nozzle to direct the air down each section. Brush your dry hair into the style you want. Finish with control force™ firm hold hair spray. Hand Relief: Apply liberally to clean hands. Reapply as needed. Thickening Tonic: Water\Aqua\Eau, Propanediol , Hydrolyzed Corn Starch, Dimethicone PEG-8 Meadowfoamate, Aloe Barbadensis Leaf Juice, Emblica Officinalis Fruit Extract, Wheat Amino Acids, Hydrolyzed Brazil Nut Protein, Hydrolyzed Soy Protein, Hydrolyzed Wheat Protein, Hydrolyzed Wheat Starch, Hydroxypropyl Starch, PEG-40 Hydrogenated Castor Oil , Dihydroxypropyl Arginine Hcl, Stearamidopropyl Dimethylamine, Cetearyl Alcohol, Hydrogenated Lecithin, Dimethiconol, Coco-Glucoside, Sodium Magnesium Silicate, Polyquaternium-4, Polyquaternium-10, Dimethicone , Acacia Senegal Gum, Maltodextrin, Sodium Chloride, Citric Acid, Fragrance (Parfum), Farnesol, Eugenol, Linalool, Benzyl Salicylate, Citronellol, Citral, Limonene, Benzyl Benzoate, Geraniol, Sodium Gluconate, Potassium Sorbate, Phenoxyethanol <ILN41216>. Hand Relief: Water\Aqua\Eau, Cetearyl Alcohol, Glycerin, Limnanthes Alba (Meadowfoam) Seed Oil, Caprylic/Capric Triglyceride, Dimethicone, Glyceryl Stearate, Polyglyceryl-6 Dioleate, Coco-Caprylate/ Caprate, Lactic Acid, PEG-100 Stearate, Aloe Barbadensis Leaf Juice, Helianthus Annuus (Sunflower) Seed Oil, Glycyrrhiza Glabra (Licorice) Root Extract, Carapa Guaianensis (Andiroba) Seed Oil, Caprylyl Glycol, Tocopherol, Methyl Glucose Dioleate, Methyl Glucose Sesquistearate, Fragrance (Parfum), Farnesol, Linalool, Benzyl Salicylate, Citronellol, Citral, Limonene, Benzyl Benzoate, Geraniol, Xanthan Gum, Maltodextrin, Magnesium Sulfate, Sodium Hydroxide, Potassium Sorbate, Phenoxyethanol <ILN45373>.